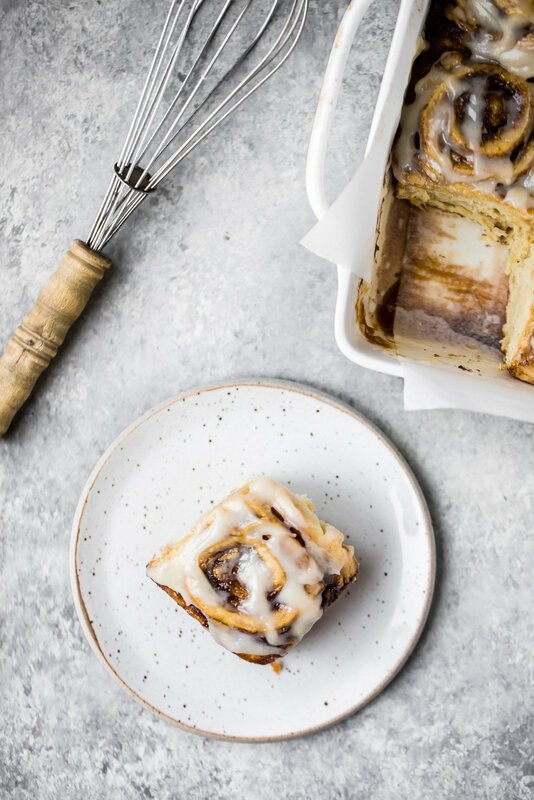 Coming to you with another glorious cinnamon roll recipe, but this time they’re completely vegan, dairy free and taste like a cross between a Cinnabon and banana bread. WHO ELSE IS READY TO GET THEIR BAKE ON? I’ve tested these approximately 5 times now to get the perfect fluffy results that will make you better than Betty, almost ask cool as Ina, and definitely as legit as Martha. (Hoping we all get these references). I tested these vegan banana bread cinnamon rolls last spring for the first time, hoping I’d get them to you in time for Easter, but it just wasn’t in the cards. I still needed time to make them better, so I decided to save the recipe for later in the year. And now it’s August. Funny how life happens so quickly. 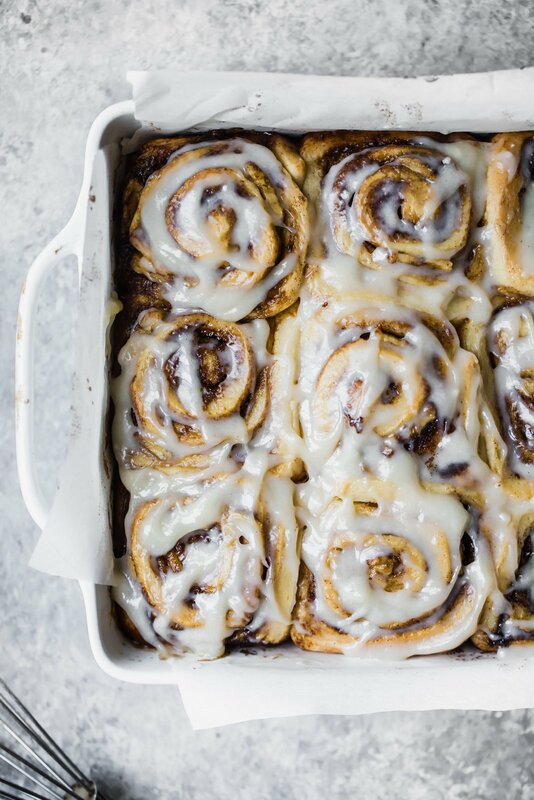 Since we’ll soon be heading into Fall and all things cozy, I decided that it was the perfect time to whip the recipe out and introduce these beautiful cinnamon rolls to the world. They’re fluffy, soft and taste like a cinnamon roll and banana bread had a baby. I MEAN COME ON, NOW YOU HAVE TO TRY THEM. Bread Flour. The trick to keep these cinnamon rolls soft and fluffy is to use bread flour. You can read more about bread flour vs. all-purpose flour here, but basically bread flour has a higher protein ratio, which means it produces a lighter and softer cinnamon roll instead of one that’s dense. It’s meant to be used in breads and rolls, so do yourself a favor and pick up a bag ASAP. Vegan butter. We’re using vegan butter in this recipe. However, if you aren’t vegan or dairy free, feel free to use regular unsalted butter. 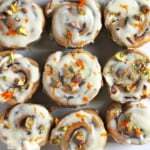 Or you can try my regular cinnamon roll recipe. Mashed banana. Not only does mashed banana help to give the cinnamon rolls that banana bread flavor, but it also helps to keep the recipe vegan. Not only that, the banana adds a natural sweetness AND softness to the dough. SO addicting. Just make sure that you measure out the mashed banana to ¾ cup. DO NOT USE MORE. DO NOT USE LESS. Trust me! Almond Breeze Unsweetened Vanilla almondmilk. YUM. This is my go to almondmilk. 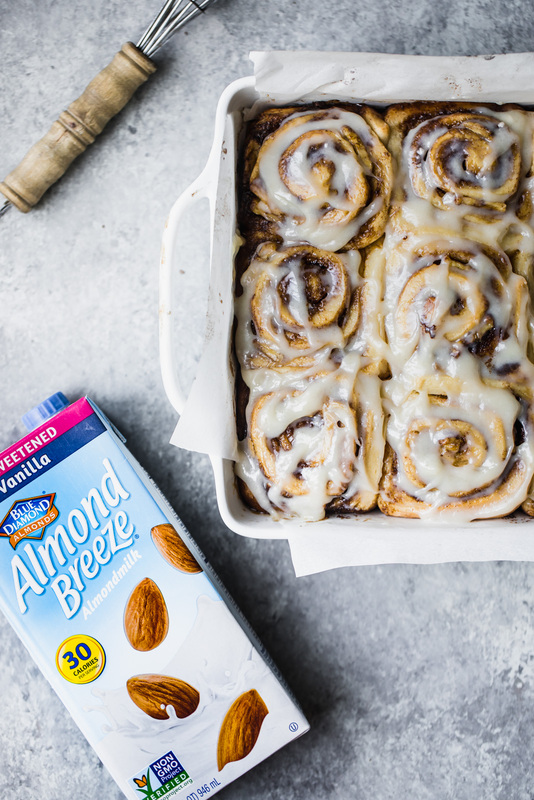 It keeps these cinnamon rolls dairy free and vegan, plus it adds a lovely hint of vanilla. Simply the best. I’m not sure what else I could tell you other than to make them ASAP. You’ll fall in love, I know it. If you make this recipe, be sure to leave a comment below and rate the recipe! You can also snap a picture and post it on Instagram using the hashtag #ambitiouskitchen. And of course be sure to follow Ambitious Kitchen on Instagram. Xo! Add warm almondmilk and sugar to the bowl of an electric mixer and sprinkle yeast on top. Stir in ¾ cup mashed banana (making sure you measured!) and melted vegan butter. Mix until just combined. Next stir in flour and salt with a wooden spoon until a dough begins to form. Transfer dough ball to a greased large bowl, then cover with plastic wrap and a warm towel. Allow dough to rise for 1 hour or until doubled in size. After dough has doubled in size, transfer dough to a well-floured surface and roll out into a 14x10 inch rectangle. Spread softened butter over dough, leaving a ¼ inch margin at the far side of the dough. In a small bowl, mix together brown sugar and cinnamon. Use your hands to sprinkle mixture over the buttered dough, then gently rub the sugar into the butter a little. 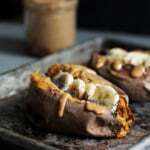 Add banana slices on top. Tightly roll dough up the dough, starting from the 9-inch side and place seam side down making sure to seal the edges of the dough as best you can. You will probably need to cut off about ½ inch off the ends of the dough as it won’t be as full of cinnamon sugar as we’d want it to be. Then cut into 1 inch sections with a serrated knife. You should get 9 large pieces. 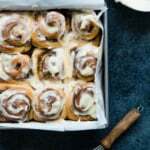 Place cinnamon rolls in a greased 9x9 inch baking pan or round 9 inch cake pan. (I also recommend lining the pan with parchment paper as well, in case any of the filling ends up leaking out.) Cover with plastic wrap and a warm towel and let rise again while you preheat your oven. 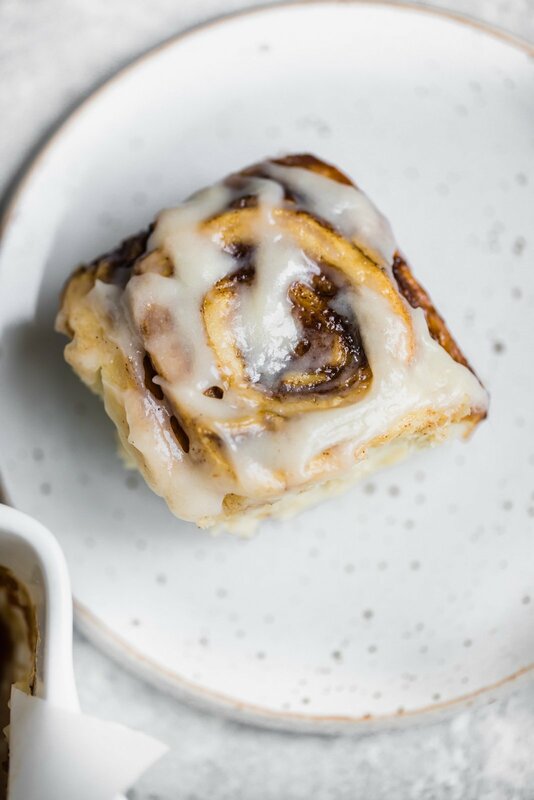 Preheat oven to 350 degrees F. Remove plastic wrap and towel and bake the cinnamon rolls for 25-35 minutes or until just slightly golden brown on the edges. You want to under bake them a little so they stay soft in the middle, that’s why we want them just slightly golden brown. Allow them to cool for a 5-10 minutes before frosting. Makes 9 cinnamon rolls. To make the frosting: In the bowl of an electric mixer or in a medium bowl, combine cream cheese, butter, powdered sugar and vanilla extract. Beat until smooth and fluffy. Add 1 teaspoon of almondmilk if you’d like a thinner glaze. 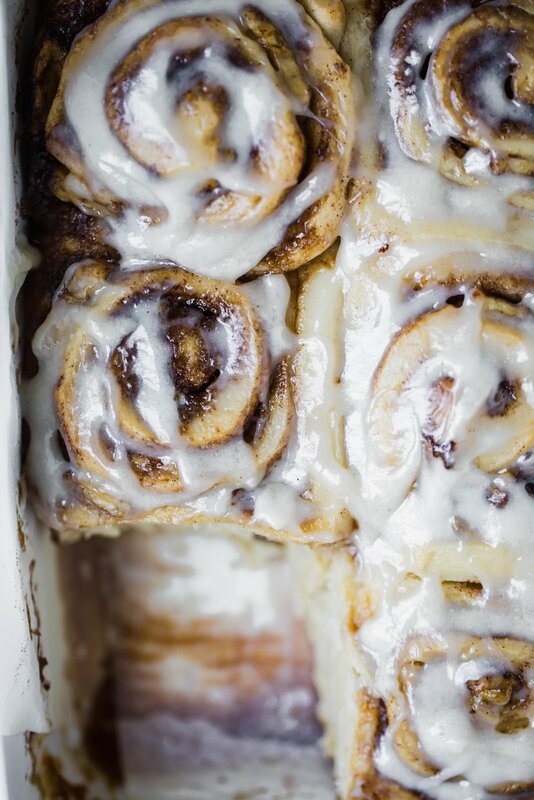 Spread or drizzle over cinnamon rolls and serve immediately. If you like a lot of frosting, I suggest doubling it. 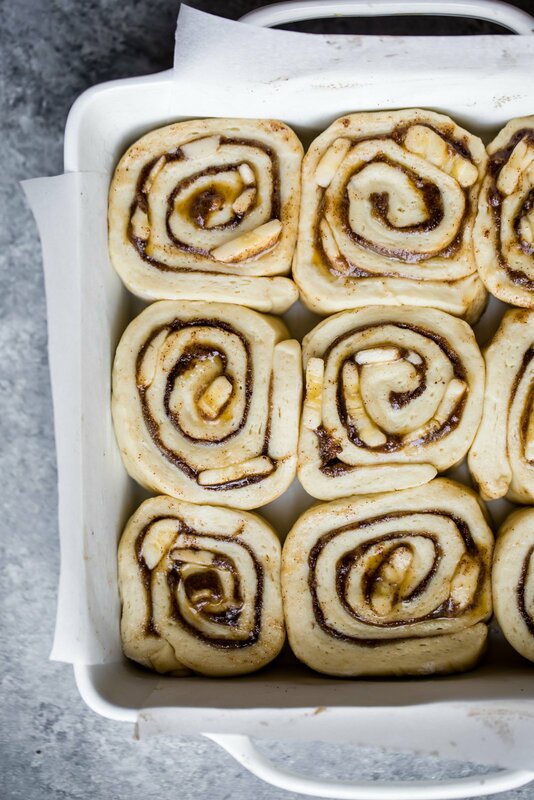 After placing rolls into the greased pan, simply cover, place overnight in the fridge and then bake them in the morning as directed. I like to bring my cinnamon rolls to room temperature first by leaving them on the counter for 30 minutes before baking (this is known as the second rise). *Feel free to use regular butter and cream cheese if you are not vegan or dairy free. 49 Responses to "Vegan Banana Bread Cinnamon Rolls"
Do you have a flour you recommend to make these gluten free? I wouldn’t recommend swapping flours in this one – the consistency just won’t hold up! You mention vegan butter 3 times, but only the filling one says unsalted. Does that mean the other 2 times, it is not the unsweetened kind? You can use the same vegan butter throughout! 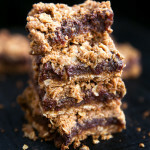 My boyfriend would devour these if I made them and I’m pretty sure I wouldn’t get a bite. Banana bread cinnamon rolls that are VEGAN?! OH SNAP GIRLFRIEND. You’ve killed it again! I will say, I wouldn’t use Almond Breeze if I make this, as some Almond Breeze milks have been recalled by the FDA for containing dairy. It’s saddening to find out that, someway somehow, they’ve been tainted with a dairy-based allergen. But aside from that, what an incredible recipe!! I HAVE to make it someday! Absolutely! Patience is key (and so worth it). I don’t, so sorry! These need to be made as is. Hi. 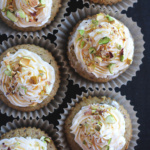 These sound amazing – I love your recipes. Thank you! I can’t get vegan butter where I live. Any ideas for a substitute? You could try coconut oil! Hi, I’m seeing this a few months later, but try lactose free Blue Bonnet! It’s $.99 where I live and dairy free! I hope you get a chance to make these! They’re definitely worth the time 🙂 Enjoy, xo! Could you use all-purpose flour instead of the bread flour? They will not turn out quite the same, but I’m sure it would work, I just would not advise it. Bread flour is what keeps these rolls soft and fluffy! Hi Nick – sorry to hear that. 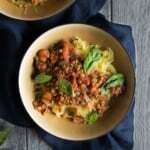 I’ve tested this recipe many times and had great results. I would be sure you used bread flour, and perhaps check out the recipe video for reference! Can you recommend a substitute for active yeast? I can’t have any yeast in my diet. I cannot, unfortunately, these cinnamon rolls need yeast to rise. These turned out amazing. I subbed applesauce for the butter in the filling and I am really happy with the results. I also left out the banana slices because hubby is not a super huge banana fan. I think that these are going to be breakfast for Thanksgiving!!! Thanks so much! Great! 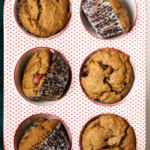 Love these for Thanksgiving breakfast. Glad you loved them! Amazing! I’m so glad 🙂 Dates sound delicious in here, too. Made these rolls yesterday and baked them this morning and OH MY WORD! They are the best cinnamon rolls I’ve ever made!!! Only changes I made was to eliminate the banana slices and I used real unsalted butter. This recipe will be a keeper! How do you recommend storing them if not all devoured in one sitting? Refrigerate? Yes I would refrigerate them! Hi there, if I make these and am not Vegan do I need to add the 1 Egg from the previous recipe for Rolls? or does the banana substitute the egg? Made these for Easter and they turned out so well!! Excited as my kids are still skeptical of anything “vegan” and they loved them! I used cashew milk instead of almond and worked perfectly.